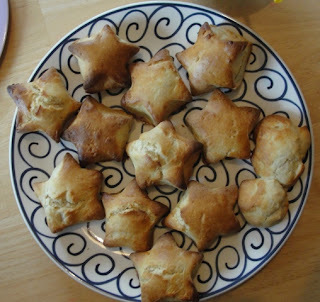 Sun Hats & Wellie Boots: Star Scones! My lovely hubby & Minnnie surprised me with a strawberry tea & these homemade treats. So I thought I'd share the recipe with you, but be warned they are very yummy!! 1. In a large bowl rub the butter into the flour. 2. Add the sugar & stir, before adding the milk. Mix to form a dough. 3. Place dough mixture onto a floured work surface and knead lightly & flatten (approx 2cm thick). 4. Using a star shape cookie cutter, cut out the star scones.You could of course use any cutter, but if using a small shape just adjust your cooking time slightly. 5. Place scones on a baking sheet & brush the tops with the beaten egg. 6. Place in oven & bake for 12-15mins or until scones are well risen & golden. 7. Place on a wire rack & leave to cool slightly before serving. They taste delicious when served warm with a little butter & jam. Nom nom nom!